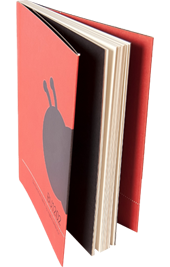 The hardcover book features a hard external cover (called a “case”). These are usually covered with cloth, leather, textured paper or similar material. The cases can be decorated with foil stamping, embossing/ debossing, glittering, varnishing, or die cutting. On some books, the spine has a different covering material than the front and back panels. This is called quarter-binding and is very popular in the publishing industry. Hardcover binding is a good choice for publishing, photobooks, yearbooks, dissertations, theses, high-end presentations, and proposals. half binding cover - wrapped with binding material and paper or two different binding materials*. * - binding materials includes special materials for a case bound book production (PVC, cloth, paper). 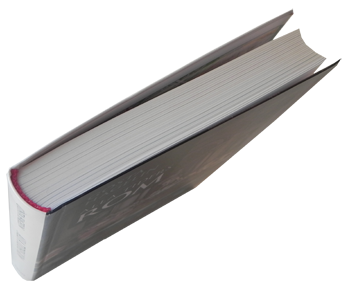 Softcover simulated to look like a hardcover with round spine and head- and tailbands, it also can have flaps. Integrally bound books (flexi binding) represent a hybrid between hard and soft bound books, it offers a higher perceived value than a traditional paperback. The sewn books, which are embellished with a stronger and soft plasticized cover is pleasing to the eye and touch, and simultaneously offers an enduring unchanged appearance (The case of the book is frequently made of art paper above 210 gsm). It is suitable for all contents and shapes and for customers with special, more modern wishes who love to always have books with them or for more demanding environments which require a more endurable book. A paper back a soft cover book putting all the pages or signatures together, roughens and flattens the edge, then a flexible adhesive attaches the paper cover to the spine. Also, some books may combine glue with sewn together signatures. 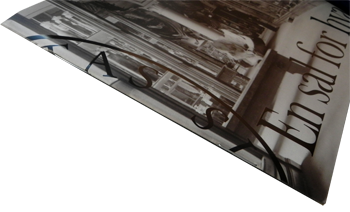 A Soft Cover Binding is ranging from regular perfect binding, sewn soft cover to soft cover with flaps. Sewn in sections - Sewn binding involves the sewing of the book block to the cover. Sewn bound books and hardcover books are similarly constructed, but sewn books do not have the hard covers. with two flaps in – when cover is wider than a block on flaps folding lines. Wire stitching is a form of binding that uses wire staples to bind sheets together. Wire stitching can either be used as side stitching, or saddle stitching. Side stitching is used for thin books that are usually then either covered with a hard cover, or a tape strip. Saddle stitching binds the sheets together through the fold in the center of several pages. It is the form of binding commonly used on comic books and magazines. Mostly periodical publications, exercise books, advertising material is bound in this way (usually up to 96 pages). With flaps (one or two). Loose – Leaf binding – from 2 to 4 holes drilled through a collected block then put on the closing mechanism. Wire – O binding - Bookbinding technique that winds a circular double-wire strip through the holes along the binding edge of the pages; also called spiral binding. Wire-o bound books lie flat when open and are useful for manuals or notebooks. Adjustable lenght perforation and etc.